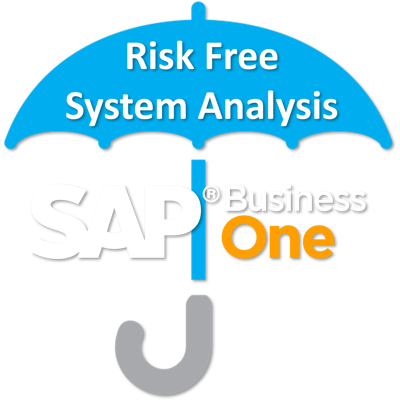 Get Your SAP Business One Risk Free System Analysis. Does your SAP Business One system need some love, but you're not ready to jump into another relationship yet? We speak with many SAP Business One users who need help with their system, and most of them want some help before we send them an invoice. We totally understand! That's why we offer a Risk Free System Analysis. Yes. Risk free means zero risk. Talk to us on the phone about your situation. If we can help you, we will request access to your SAP Business One system. Our team will spend a day analyzing your system. We will provide our written recommendation to fix the issues you're experiencing, or outline any enhancement opportunities. If you decide not to hire us, we'll happily go our separate ways and you owe us nothing. If you decide to hire us, we'll include the analysis ($1,995) into our first project proposal. It's our mission to make supporting your SAP Business One system as simple as possible, and risk free is as simple as it gets. Please share this with someone on your team.